Checkout gives your buyers a simplified and secure checkout experience. The most relevant payment types to your shoppers, automatically, making it easier for them to complete their purchase using methods like Pay with , Credit, Credit Card payments, and other payment types depend on your country. 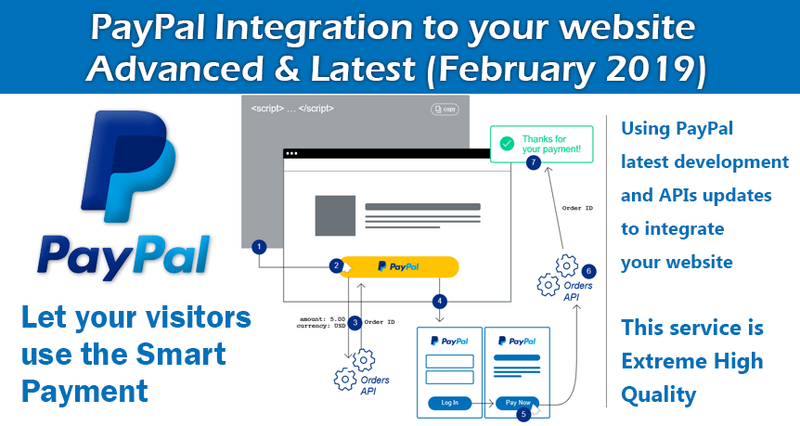 You add the Smart Payment Buttons to your web page. The button calls Orders API to set up a transaction. The button launches the Checkout experience. The button calls Orders API to finalize the transaction. API updates. New, changed, and deleted resources, request parameters, and response fields. New features. New dashboards and tools related to the REST APIs. Functional updates. Functional updates to operations, including new code list values and validation rule changes. Announcements. Announcements related to the REST API. Doc updates. Documentation updates not mentioned in API updates, new features, functional updates, or announcements. I will Guide you from A-Z , Creating a sandbox accounts and integrate the Payment to your website then test the payment using the sandbox accounts and finally, Go Live.